Though not exactly a blockbuster in its time, Carnival of Souls managed to snag a cult following. In fact, you may have caught it at an art house theater or even someone else’s Halloween party, so one could argue it’s a bit overplayed. That’s no reason to discount it, though, as it’s still a thoroughly creepy tour through a hellish small town (or just hell?) filled with offputting sound effects and organ music. While this adaptation of the hit video game series didn’t garner much in the way of ticket sales, Silent Hill is nonetheless one of the better game-to-movie translations released. Though the shoehorned husband character doesn’t add much and the plot is somewhat nonsensical (like the games, which I love), Christophe Gans managed to stuff as much creepy atmosphere into it as he could, including several musical pieces straight from the games. The end suffers from a CGI explosion, though while gory, does jar some out of the experience. Still, a good choice to have on in the background. Some have complained about the lack of plot in House of the Devil, but I argue that there is just enough present to make a terrific film. And besides, you almost can’t get more atmospheric than this film! With little music besides the haunting score (and the occasional 80’s tune), the quiet leaves us wondering just what is going to happen to this nice young lady in this huge house. And when it comes, it comes with a vengeance! 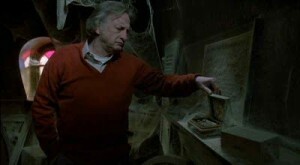 Not the Clint Eastwood/Angelina Jolie match-up, the 1980 George C. Scott led spookfest supposedly based on true events. With chilling piano music, haunted wheelchairs, and the scariest bouncing child’s ball ever seen, this tale of a grieving husband and father who is haunted by the ghost of a Senator’s kid will quickly capture your partygoer’s attention. One of the better haunted house films. You’re having a party, so there’s no need to listen to dialogue anyway, right? So why not put on a silent film? 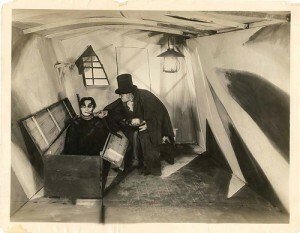 The most influential of the German Expressionism films and often cited as having the first “twist” ending, The Cabinet of Dr. Caligari is a great moody choice for any Halloween extravaganza. The distorted sets, elaborate make-up, and gothic music all make for a frightening experience. Put this one on for guests to enjoy, but don’t be surprised if instead of leaving out of boredom they run screaming for their lives! This entry was posted on October 29, 2010 at 4:01 am. You can follow any responses to this entry through the RSS 2.0 feed. You can leave a response, or trackback from your own site. 1 Response to "5 Atmospheric Horror Movies for Your Halloween Bash"